Gingko leaves have fallen and been piled up with a kind heart carried on the wind, making the streets of autumn tinged with yellow. Please come and see the mellow autumn landscape in your closest space. We added the least design while keeping natural beauty of natural material itself the most. 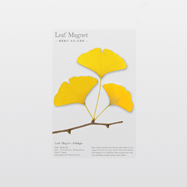 Realistically made ginkgo shaped magnet can be used for various places like partition, white board, refrigerator and etc and you can create the feeling of ginkgo with it as interior prop.